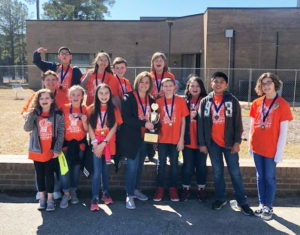 The Pine Level Elementary Green Hornets were the first place winners of the Johnston County Public Schools Elementary School Battle of the Books Competition on March 6 at Johnston Community College. Those photographed on the front row (from left) are Ella Pilkington, Addison Parrish, Katie Holloman, Coach Karen Parker, Josh Leonard, Emily Holland, Anthony Franco, and Gracie Corbett. Those photographed on the second row (from left) are Coach Wanda Mourer, Juan Martinez, Savana Higgins, Wilmond Barnes, and Kaden Zane Holloman. Not photographed is Coach Stephanie Guerra. The Pine Level Elementary Green Hornets were the first place winners of the Johnston County Public Schools Elementary School Battle of the Books Competition. Students on Battle of the Books teams from several JCPS elementary schools participated in the competition held at Johnston Community College on March 6. The first place winner of the competition was Pine Level Elementary, the second place winner was McGee’s Crossroads Elementary, and Riverwood Elementary and Cleveland Elementary tied for third place. Participating schools included Benson Elementary, Cleveland Elementary, Corinth-Holders Elementary, Dixon Road Elementary, East Clayton Elementary, Four Oaks Elementary, Glendale-Kenly Elementary, McGee’s Crossroads Elementary, Meadow School, Micro Elementary, Pine Level Elementary, Polenta Elementary, Powhatan Elementary, Princeton Elementary, River Dell Elementary, Riverwood Elementary, Selma Elementary, South Smithfield, West Clayton Elementary, West Smithfield Elementary, West View Elementary, and Wilson’s Mills Elementary. Students on the winning team are Ella Pilkington, Addison Parrish, Katie Holloman, Josh Leonard, Emily Holland, Anthony Franco, Gracie Corbett, Juan Martinez, Savana Higgins, Wilmond Barnes, and Kaden Zane Holloman. The students are coached by Stephanie Guerra, Wanda Mourer, and Karen Parker. “I love these kids and am just so proud of their accomplishments this year,” said Parker. The PLE Battle of the Books team received a warm welcome back after their competition by all of their classmates and teachers cheering them on outside of the school. The team will move on to compete at the Regional Competition on April 13 at Polenta Elementary.